Aaron's Christmas wish list was made up entirely of Lego sets. I'm not sure what he would have done if he'd actually received every set he asked for (probably keeled over with happiness), but instead, he got one medium-sized set and one small set. Fortunately for him, Maxwell and Bradley each got a set as well, and they don't really love putting them together, so they let him do it for them. He knocked off all 400+-pieces sets in two days. To say he is Lego-obsessed would be something of an understatement. It's all he thinks or talks about, and I'm sure many of you have similarly obsessed children. But before there were Legos, there was something called an Erector set. Heard of it? Probably, because it is now one of the most iconic toys in toy history, ranking right up there with Raggedy Ann and the jack-in-the-box. It was invented by a young man named A.C. Gilbert in the year 1911 and was one of the first building toys of its kind. With a metal box full of nuts, bolts, steel girders, and cogwheels, a child could build just about anything. And he (or rarely, she) did. These weren't just cute models but miniatures of the real thing (although I don't necessarily think of a five-foot zeppelin as "miniature"). But Gilbert didn't just invent a new toy. He completely changed the face of the toy industry. He changed the way toys were advertised (his famous slogan, "Hello Boys! Make Lots of Toys!," spoke directly to the potential builders themselves instead of their parents). He loosened Germany's grip on the toy industry and handed over the responsibility (and the profits) to American toy makers. He created toys that were educational and taught life-skills, something that was really unheard of at the turn of the twentieth century. 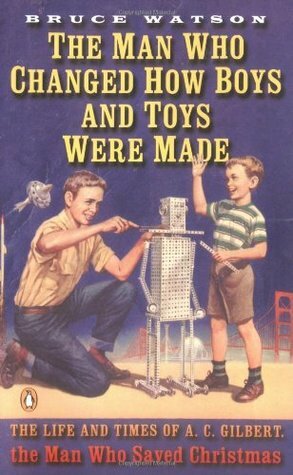 Of course I'd heard about Erector sets before I read this book (I think my dad may have even had one when he was a kid), but most of the information was completely new to me. At times, Watson's writing style was a little presumptuous and exclamatory, but that's not unlike Gilbert's own style, as found in the magazine Erector Tips, so maybe it was appropriate. (I also could have done without Watson's personal stories--they felt totally gimmicky). He was often told that he needed to raise the price on his small tool chests: "We can't sell them for $1.98. We're losing a buck on every one." But Gilbert wouldn't do it. He told his employees to "make up the loss somewhere else." He wanted to keep at least one set affordable for even the poorest of boys. One of the subtitles of the book calls Gilbert "the man who saved Christmas." Again, a little presumptuous, but there is some truth to it. In 1918, with WWI still raging, the Council of National Defense proposed a ban on all toy sales. Gilbert and several other members of Toy Manufacturers of America were given fifteen minutes to try to persuade the council otherwise. Gilbert acted as spokesman and said, "The greatest influence in the life of a boy is his toys. A boy wants fun, not education. Yet through the kind of toys that America toy manufacturers are turning out, he gets both. The American boy is a genuine boy and he wants genuine toys. He wants guns that really shoot, and that is why we have given him air rifles from the time he was big enough to hold them. It is because of the toys they had in childhood that the American soldiers are the best marksmen on the battlefields of France." So there you have it. Not exactly the kind of glowing endorsement that would have convinced me that American kids needed Christmas, but it worked its magic on the council. They didn't ban toys, and Gilbert saved Christmas (for that one year). "Today's most popular toys--even those for thirteen-year-olds--are pure fantasy. But time was when toys were mock-ups of the grown-up world, preparing children for it day by day, doll by doll, model by model. When a society is in sync with its toys, children are not afraid to grow up, and those who come of age with such toys can look back and see the person they've become in the toys they once loved." Gilbert's Erector sets and other kits did that, and there are still many toys on the market that promote those same values. They might not be the most popular, but they're there. And that's where my money will go. What is the best toy you've ever purchased for your child? Tell me about the toys in your house that just keep on giving. Looking at the picture, are these a precursor of mecchano sets? My brother had one when we were kids. Hmmm, maybe. I don't remember Meccano being mentioned specifically, but I know a lot of toys grew out of the Erector sets. Yes, I think you can't go wrong with building toys! So many things to do with them! I only buy toys for my kids that I personally want to play with. Haha! It sounds horrible but I've learned that what they really want is to play with me (or dad, or each other). Add to that the fact that I'm going to spend a lot of time looking at and picking up these toys, and if I don't like it, I'm not buying it. Happy meal toys disappear mysteriously (muahaha) and the kids sometimes save up chore money to buy a toy I don't want to buy them. That's a great way to decide what's worth buying! I was talking to a piano student today about what she got for Christmas and she mentioned two board games that had horribly rude names and also a six-foot stuffed bear, and I was just kind of flabbergasted that anyone would spend money on such toys! So now I'm curious...what toys will you play with? The best toy we ever purchased was the Melissa and Doug wooden block set. Those blocks get used for everything, not just buildings, but stand-ins for tools, food, silverware, animals, and anything else a block of wood can possibly be imagined to be. This year we ventured into duplos for Christmas (I'm not sure we're ready for real legos yet), and we'll see if they get as much imaginative play. I definitely prefer open-ended toys that allow for a lot of creative use. Yes, blocks! Such a classic, useful toy! My kids actually never got into Duplos (even though we have a ton), so if your son doesn't love them, don't give up hope on Legos for the future.